RAVENOL Air Filter Cleaner Spray is an aerosol spray cleaner for foam air filters developed to effectively remove old filter oil, dust, sludge and other contaminants with minimum effort to restore peak filter performance. Designed for quick and effective degreasing and cleaning of even thoroughly crusted deposits to allow optimum air flow through the filter. Quick-drying in use, it has a chlorine-free formulation and contains no ozone-depleting components. 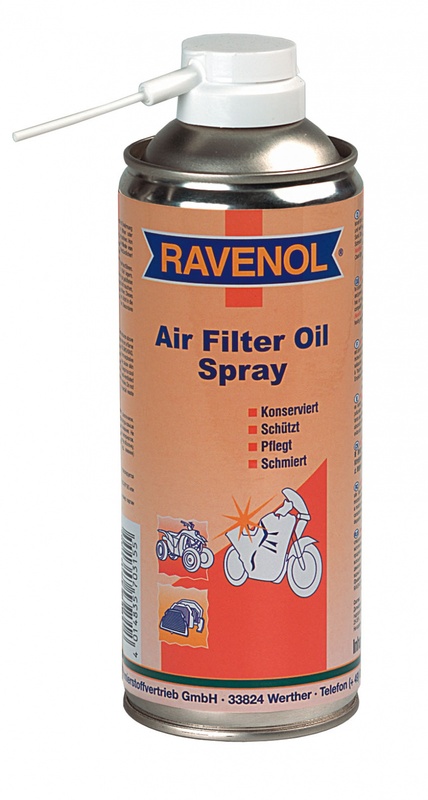 RAVENOL Air Filter Cleaner Spray is suitable for foam air filters found in all types of bikes, and is especially suited for use in moto-cross, off-road, and quad bikes, as well as all other types of machines subject to high levels of air-borne and other contaminants. Remove the foam air filter insert and clean thoroughly with RAVENOL Air Filter Cleaner Spray. For best results, it is recommended to then spray the filter generously with RAVENOL Air Filter Oil Spray and refit. Application time: approx 5-10 minutes depending levels of filter contamination. It is advisable to check for compatibility with plastic and varnished components by a preliminary test prior to use.